I was very excited to receive this sling. It looked like a great solution. 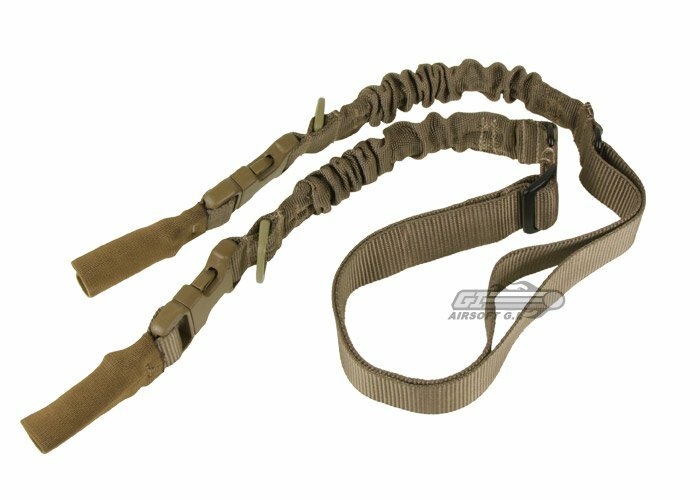 I would have a sling that could adjust itself to the lenght I needed: the bungees would stretch when I slung my M16 over my shoulder, and shorten back up to a nice compact length when I needed my sling to be out of the way. Well, I was fairly well heart-broken when I attached each of the sturdy, full metal clips to the mounting points on my rifle. The sling strap hung so low that I was having trouble figuring out how I was going to be able to get it out of the way effectively. I am not a small man. I stand at 6'2" and weigh in around 230 lbs. So, when I say that this sling is too long to be of any real use as a two point sling, you can bet that I know what I am talking about. If you are looking for a one-point sling, this may work fairly well. However, it suffers from the fault of any hybrid: it is not as good as something made specifically for the purpose. I would recommend a true 1-point sling in that case. I will be sending this back. That is a first for me. Received this last night. Great sling high quality materials and comfortable fit. It's convertible from two point to one point if you choose. I purchased it to mainly use as a two point for my M14 and as a one point for my M4. My M14 is full metal and weighs quite a bit so I wanted a sling to take some of the weight off my arms during the game.